My biggest regret now that I am 34 is that I was not able to do solid beauty regimen as young as I can. The first few lines of wrinkles on my forehead appeared when I was 18 because I never ever cared of putting sunscreen protection. My fondness of traveling has exposed me to longer hours of under the sun i.e. island hopping, mountain hiking, city tours and so on. Well, as they say it is never late to start anything. As a blogger, I always join events and meet a lot of people that's why it is just appropriate to take care of my skin specially my face. It is a real struggle for me to find what brand of facial care fits my budget and what's the reaction of my skin. Good thing, I was introduced to this brand called Novelina Cosmetics. 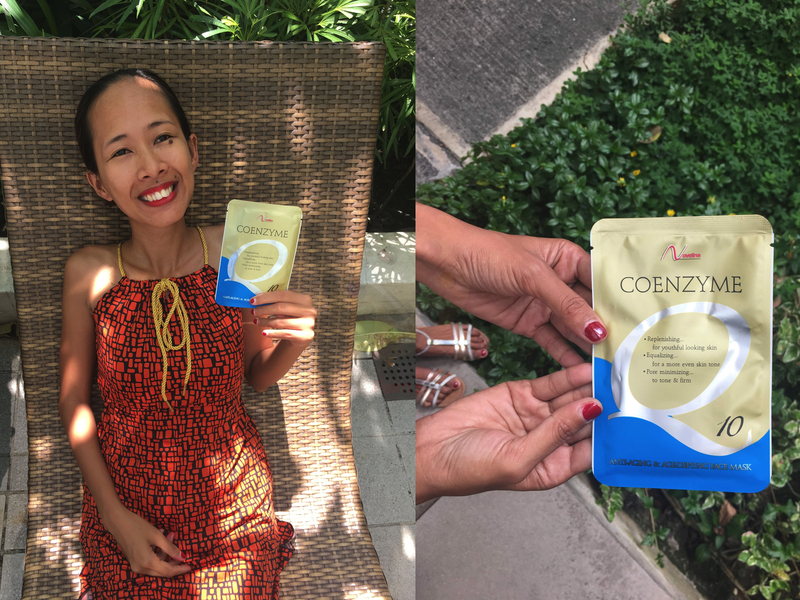 The one that I have been using is the Coenzyme Facial Mask for a few weeks now. So far, it is doing good on my face. You can really tell from my photos that natural glow even without make up! Every pack of Novelina face mask contains Coenzyme Q10 that’s known as a natural antioxidant fighting UVA damage that normally causes skin to look older. I don't know of any person here in Manila or around the Philippines who do not go out so basically we all need this. Every time we go outdoor during the daytime, we are exposed to sunlight's harmful effects. Applying facial mask regularly helps reduce fine lines and other signs of skin aging. Who wants to look older? None, right? Looking young gives us confidence to face the world. Feeling insecured and shy because of how you look is less. Helps make skin smoother and younger looking. The feeling of having a smoother skin at the start of the day inspires us to accomplish more things. For some reasons, it sets our mood in the right way to the road of fulfillment and feeling young. Helps reduce dark spots and UVA damage caused by sun. I am crazy about photos. I love posing in front of the camera for Instagram. Looking perfect in front of the camera specially without showing any dark spots is my ultimate goal. Facial masks are designed to lessen these dark spots and the most important, shield you from the UVA sunrays. Enhanced with fish scale collagen to make skin tighter and more supple, Novelina facial mask is the way to go ladies! I know not all of us can afford a Belo session so for those who are practical, this is the answer. This facial mask is only Php 45 per pack! Novelina has a wide array of skin cares that you can also use for maximum results. Using the Novelina facial wash deep pore cleanser (Php 129) plus the Ultra Lightening Soap (Php 79) for your body will give you much better result from face to your whole body. You can buy Novelina's product via Lazada or Shopee for your convenience. Of course, a positive attitude in life makes us beautiful inside and out so don't forget to always smile!